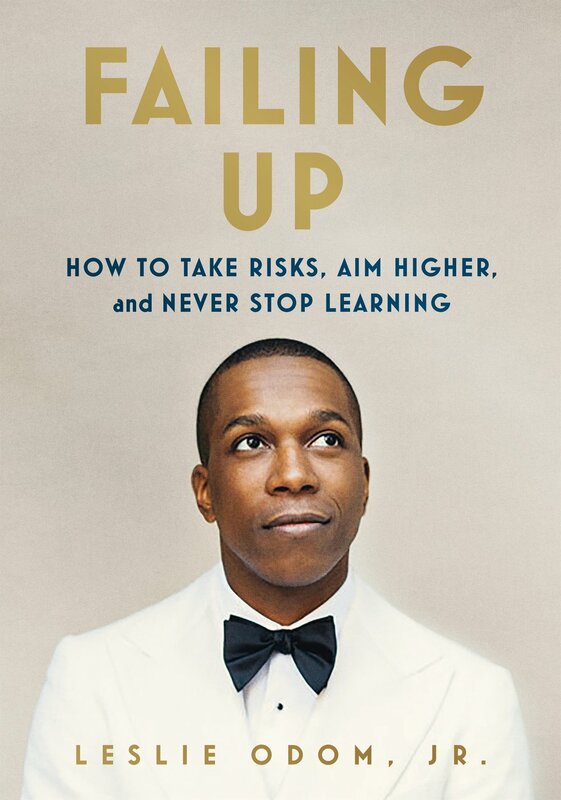 An excerpt from FAILING UP © 2018 by Leslie Odom, Jr.
FOR ACTORS OF COLOR, A LARGE Determining factor of our success in the business is closely related to how good we are at translation. Flashback to the hundred-year-old text—I was cast in a benefit reading of Thornton Wilder’s lasting and iconic Our Town for the Actors Fund in New York. The one-night-only event would feature the talents of B. D. Wong, S. Epatha Merkerson, Celia Keenan-Bolger, and others whom I had long respected and admired. These types of nights can be a lot of fun, but preparation is key. They’re well attended by industry insiders. The evenings are relatively low stakes but very high pressure. You want to feel good about how you did because there are no do-overs. A couple of days before the first rehearsal, while preparing to play George, the young male lead of the piece, I found myself smack-dab in the middle of a mild identity crisis when asking myself the question: But who am I really? You see, Thornton Wilder’s beautifully wrought Our Town was never intended to be My Town. By that I mean, even though Our Town tells the story of the fictional Grover’s Corners, New Hampshire—a stand-in for a kind of Everytown, USA—when looking at context clues from almost every major production of the seminal work, there don’t appear to be any people of color drawn in Wilder’s quintessential American town. Our Town, which follows the lives of George Gibbs and Emily Webb and those of their families, and some of the town’s other residents, did have universal dimensions, to be sure. The play is set in 1901 and takes place over a period of twelve years. Narrated by an omniscient “Stage Manager,” the script takes us through different life stages that run the gamut from the mundane to the peaks of romance and marriage, and the lows of death and loss. At the time of its debut, Our Town—staged with no scenery and no curtain—was considered to be a radical departure from traditional theater. After a thorough read of the play, it was time to begin the process of finding honest, empathetic pathways to a credible portrayal of George. It always begins with as strong a vision as I can conjure of myself inhabiting the world of the play. But this time, try as I might, I couldn’t get a clear vision. I couldn’t apply much of my American experience to Thornton Wilder’s New England town. In my deep dive, I had serious doubts about whether Mr. Wilder wrote his play with an eye toward the color-conscious casting of his seminal work at some distant point in the future. Wilder wrote the truth as he imagined it. He wrote the truth about a small town of white strivers at the turn of the century. It is through his detail and specificity that he is able to tap into powerful and universal truths about the human experience. Obviously, plays about the specific and unique concerns of a town full of black people at that same point in American history would have an entirely different language and tone. For context, 1901 saw the first publication of Booker T. Washington’s Up from Slavery, about his life’s journey from child slave to nationally renowned orator, philosopher, educator, and author. Just five years earlier in 1896, Plessy v. Ferguson cemented legal segregation of the races, with a landmark decision handed down from the highest court in the land. It was a line drawn in the sand and on our buses, train cars, restrooms, diners. It set the stage for the future American horror stories of the Jim Crow South. In 1905, W.E.B. Du Bois founded the Niagara Movement, a civil rights organization that preceded the NAACP, whose prescient ethos called for an end to racial segregation and disenfranchisement. All around the United States, there were riots rooted in the protest against racism and its ugliness. The mundane existed for black people in 1901, too. We cooked breakfast, lunch, and dinner as well. We went shopping and dancing. Black children played hopscotch and football in the street, too. But the more I read and tried to imagine, the more it felt like my casting and Mr. Wilder’s text were at odds. It was the trickiest translation job I’d ever been given and I wasn’t sure it was going to work at all. 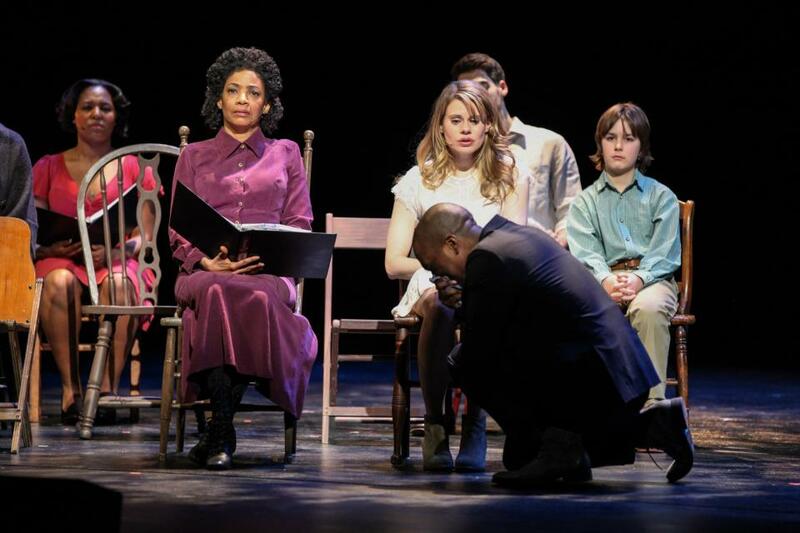 Am I a Black George in Thornton Wilder’s Our Town? Am I to investigate the way these scenes would play differently as Black George? 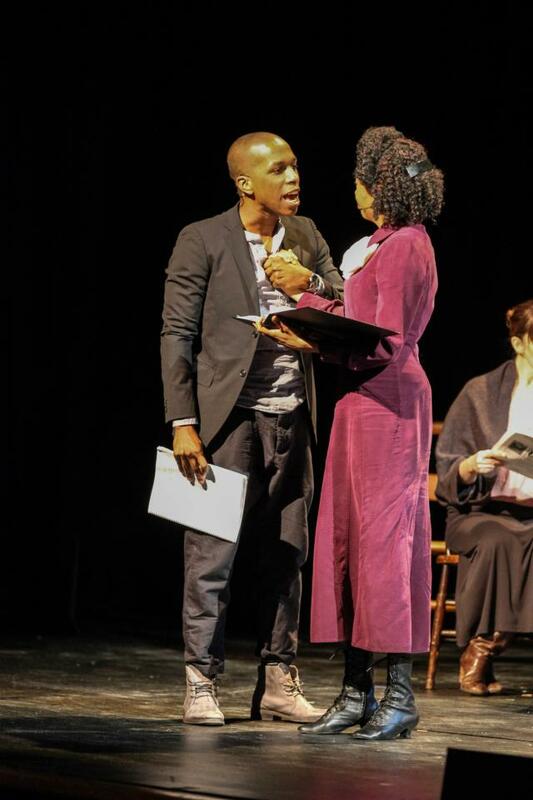 Won’t my race impact the power dynamics in the play or dramatically alter the temperature in some of these scenes? Or . . . am I meant to ignore all this? Am I a white person for the evening? Am I, instead of Black George, “Black George in Whiteface”? My imagination had posed the question: Who am I really? Integrity demanded that I hunt down the answer. Logical solutions eluded me. I had no clue how I was going to translate Mr. Wilder’s text into anything that came close to a truthful rendering onstage. In the midst of something of a downward spiral, I paused, and after some deep breaths, the voice of my wiser self took over. This is an experiment and no one has the answers. You have been invited into the room to search for the answers alongside your collaborators. You’re afraid. Guess what? So is everybody else. This experiment will work or it won’t work, but you’ve been invited into the room to explore. The exploration is the mission. You have the permission to fail. I had to remind myself of it then. I have to remind myself of it today. We all have patterns we repeat. Learn to recognize your patterns early. Maturation is only learning to spot these patterns and having the self-discipline to make different decisions once you do. Practice will make the process faster. Life has shown me again and again that the answers to some of the most profound questions can only be revealed during the expedition. Those first risky, wobbly steps will require some heart and your humility. We found our way to Our Town. The audience received us well, and I’d had a transformative experience along the way. I carry the lessons with me today. Representatives from Thornton Wilder’s estate came to see the one-night only benefit. One commented that it was one of the most poignant and moving versions she’d ever seen. Nicolette and I had just gotten married. This was the first piece I’d worked on since then, and I was able to connect emotional dots of love and loss in ways that I never knew were possible for me. There was a new emotional depth I’d found in my life that I was able to bring to my work. As for the translation of the text, we discovered that there were more than enough cognates in the Universal language of the heart and the language of our shared humanity to bring a collective light of truth to Our Town. The new emotional depths and possibilities came as somewhat of a revelation to me, and I couldn’t wait for the opportunity to test the limits once more. Reprinted by permission of Feiwel & Friends, an imprint of Macmillan Children's Publishing Group, a division of Holtzbrink Publishing Holdings Limited Partnership. All rights reserved.